A paradox of rail’s conquest of the mountains is that it progressed from the top down. High sections were equipped with cog-wheel track before valleys received normal lines. Cars dealt a terrible blow to these small train companies, particularly in France. But they may be making a comeback ! Between Grenoble and Gap, a train makes its way through the Trièves and around the Dévoluy, in a magnificent Alpine landscape, but also, just beyond the tracks, a remarkable human landscape. The photos by Bernard Fontanel join perfectly with the souvenirs of a teenager, way back when. A trip in time. Why does Switzerland have such an excellent rail network in its mountains, contrary to the neighbouring countries ? Because it sees the mountains as an advantage and developed a true service for travellers, tourists and the inhabitants in a virtuous circle that should inspire other countries. Just after 1900, John Grand-Carteret, a writer and journalist, wrote La Montagne à travers les âges (Mountains through the ages), a sweeping presentation in two thick volumes. Abundantly illustrated and documented, it remains a classic work. In the second volume, one chapter looks at the rapid opening up of mountains, notably thanks to railroads, as is shown in this excerpt. Handsome train stations made of wood, modelled after Swiss chalets, sprang up during the Belle Époque. By cleverly mixing the novelty of rail travel and old Alpine clichés, Swiss train companies imposed a rational, prefabricated template. Particularly in Gruyère where the buildings contribute, still today, to creating a landscape for travellers looking for picturesque settings. Train posters bear witness to their period better than any others. Eager for publicity, train companies have produced a considerable number since their founding. Both anonymous and well-known artists contributed to a graphic adventure throwing up an astounding panorama of styles. In the North-East of India, a picturesque choo-choo has scaled the first foothills of the Himalaya since 1881 to reach the small town of Darjeeling at over 2 000 metres altitude. In spite of all obstacles, the little train, recently admitted to the world heritage list, continues to operate and offers its passengers an unforgettable experience. Twenty train excursions from the mountains of Corsica to Austria. 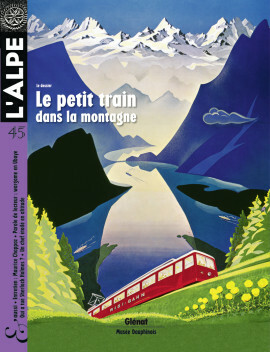 A selection made by L’Alpe to discover the Alps in a most original manner, from one small train line to the next. A major figure in Swiss literature, a poet with a strong pen rich in images, Maurice Chappaz died in January 2009. A very spiritual person, the writer sang the praise of a world threatened with extinction. This discussion was held in his home, in the Val de Bagnes, in the Valais. « I am an Afghan ! », shouts the author of this text, with a direct bearing on our last issue. Though the Alpine troops have virtually abandoned Barcelonnette, the region remains ideal for training in difficult terrain. Following the events in Afghanistan, the military presence has become even more overbearing. At the end of 2008, major manœuvres involved over 1 000 troops with helicopters, fighter planes, etc. More than enough to exasperate the inhabitants. Who killed Sherlock Holmes ? The Reichenbach falls, in the Berner Oberland, are the scene of a famous death, that of Sherlock Holmes, drawn into the abyss by his mortal enemy… and by his creator, Sir Arthur Conan Doyle. This year marks the 150th anniversary of the birth of the British author and inspector Fenoli investigates the true reasons behind the crime. The contest announced in our anniversary issue asked readers to tell us about their Alp, in words or in pictures, as a counterpoint to the intimate mountains of our authors. We wish to thank and congratulate all those who sent in their very personal contributions. The decision was difficult for the jury, but they nonetheless selected this interesting submission on landscapes and how they are perceived. Jean Sulpice, an inventive and demanding chef, now has the highest-altitude Michelin star in Europe ! In his restaurant in Val Thorens, the young man from the Savoy does wonders with the best local products. Discover the man and his cuisine in a handsome book just published by Glénat, Altitude 2 300 m.